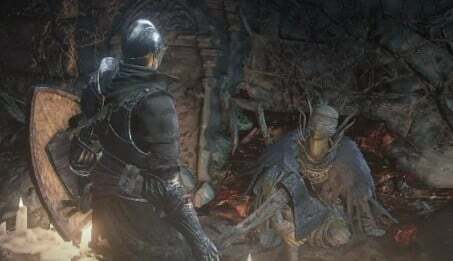 Cornyx of the Great Swamp is an NPC in Dark Souls 3. Cornyx teaches pyromancies, acts as a merchant, and upgrades the Pyromancy Flame. Can be a Merchant, see list of items sold below. Can't teach from the Quelana Pyromancy Tome, it requires a female teacher. See Karla for more information. Can't teach from the Grave Warden Pyromancy Tome as it contains dark pyromancies. This tome must be given to Karla. You can find Cornyx at the Undead Settlement, where he will offer you his service. He is located in a cage at the top of the building that has 3 firebomb throwing Undead. 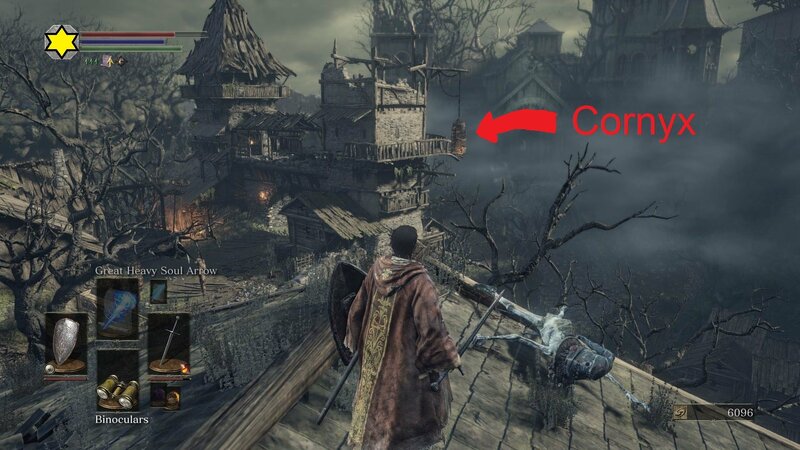 In order to get there you will need to drop down from the cobblestone bridge that is near the Cliff Underside bonfire and ascend to the top of the building to reach the balcony where his cage is. After accepting, he will relocate to Firelink Shrine where he operates as a merchant and provides Pyromancy training services. To find him in Firelink, approach Blacksmith Andre, and head right down the stairs. He will give you a Pyromancy Flame and speaking with him a second time will unlock the Welcome Gesture. If you summon White Phantom Great Swamp Cuculus (right outside Old Demon King fog) in the Smouldering Lake and defeat the Old Demon King, you can find the Spotted Whip, and a set of Cornyx’s Garb where you rescued him in Undead Settlement (Note: If Cuculus die, then you can't get these items). I am Cornyx, an old pyromancer. A crow in his cage as you see, now. But here we are, an encounter for the ages! I hear the Unkindled make for fine vessels. Care to learn pyromancies from this old man?" Most wise. A chance encounter should not be squandered. To reiterate, I am Cornyx, of the Great Swamp. (snickers) Most foolish. This old crow has a little knowledge on his own, you know. Bah. No sense in spelling it out. I will not rush you. You will return, once you are enlightened. Ahh, there you are, Unkindled One. For trusting a lowly pyromancer, and allowing me to gaze upon this majestic flame. As promised, I will impart pyromancies to you. But first you will need a flame of your own (Gives Pyromancy Flame). Careful you don't burn yourself with it." Heed my words, Unkindled One. The home of pyromancy, Izalith, was scorched by the very fire it created. Undoubtedly, it was a flame of chaos, tangled by a witch's hand. But who's to say that this Bonfire's flame is any different." Ah, what have we here! A pyromancy tome from Izalith! Then you've found the home of Pyromancy. Brilliant. I will never curse being old and Undead again. Now, now, show it here, quickly. Let us channel them together. The primal pyromanices known only to old Master Salaman!" Little bird, what's to be gained?" Character inspirations, fan art, cosplay goes here. Cornix is the latin name for crow. Why does his summon sign appear as female? This guy is why I see no reason to start as a pyromancer. LOOK AT ME NOW!!! I&apos;M A FIREBALL LOBBING, GREAT SWORD USING KNIGHT IN FULL ARMOR!!! Why does he have goat carcasses behind him? This NPC is virtually useless outside a casting build. Still cool tho, there is a lot of useless npcs in regards to differing playstyles so.. not really a surprise there just thought I&apos;d look him up and see if he has anything else to offer other then magic support/resource. Killing him is the only way to get a second pyromancy catalyst.....but he&apos;s also the only NPC capable of upgrading said catalyst. This means you are required to beat Sully in NG+ before being able to PvP with your true, pure pyro build. But those dedicated to the fire are all mad, are we not? when you press &apos;Leave&apos; at Cornyx&apos;s menu window, he should say "What a pupil without a TEACHER..!!" "One who understand nothing, can understand nothing..!!" The summon must be alive by the end of the fight to get the armour. Douche bag Pyromancer: wont teach you female based spells; walks around in a skirt. I believe this quote happened to me right after I killed the Crystal Mage Boss. "Fine, fine, I see how it is.When a pupil strays from the path, the master must intrude. "Vaguely reminiscent of Gherman&apos;s line from Bloodborne:"Oh, it doesn&apos;t matter... It always comes down to the Hunter&apos;s helper to clean up after these sort of messes." What of he&apos;s Flann? the dlc trailer features him alongside the likes of nameless king and the twin princes. He&apos;s a male pyromancer, and wont touch chaos flame or dark flames, both of which are anathema to gods. I&apos;ve seen plenty of people theorize that the self mutilating boss in the dlc trailer was Guinevere, and so it would make sense that he is trying to get people to go find her, she&apos;s his wife. At the very least he&apos;s connected to the painted world, since the exiles are worshipping our grave in the untended graves which is where he was performing some unknown pyromancy, maybe setting us up to rise as ashen ones? Cornyx has a set of lines that is not recorded here. Once you&apos;ve given him the Carthus Pyromancy Tome, he hints at the existence of the Izalith Tome. "Ahh, you found this (spoken &apos;a&apos;) tome in the Catacombs...""This spell is akin to chaos. It may even serve as a link to Izalith, home of pyromancies." I seem to have encountered a bug. I have freed Cornyx, and found the Carthus Pyromancy tome. I THOUGHT I gave him the tome, but he will not sell me the Carthus Pyromancy&apos;s. I also do not have the tome in my inventory, nor the pyromancys. I also cannot pick up the tome, as it&apos;s gone from the game from when I first picked it up. Anybody got any ideas on what&apos;s going on here? Note: Great Swamp Cuculus must NOT die in the Old Demon King boss fight. If she does, then you must restart the boss. Otherwise you will not get the whip and cornyx set. Anyone notice how he&apos;s surrounded by dead goats and crows? I was curious whether or not they were there from the start, however there are no goats/crows in the Untended Graves, and there are no goats/crows at his location before you recruit him in NG+. I summoned great swamp cuculus for the old demon king fight and went back to cornyx&apos;s cage and there&apos;s nothing there? Does great swamp cuculus need to be alive when the old demon king dies? Great Swamp Cuculus must survive the fight with Old Demon King to get the whip and armor set. Must say pretty dissapointed, after getting all of his things and upgrading flame, you will get nothing but his ordinary phrases, he will still sit there without any purpose.I was hopingfor some *goodbye i must go* or some event but alas nothing happens. So am I missing something? I did the fight and had the NPC but the armor didnt appear in his cage. wtf.